Petflex Pawprint Bandages from Andover are easily applied and stick only to themselves. They also allows skin to breathe and hold well even when stretched. They should not be placed straight onto a would, they need to be applied over the top of padding (like Soffban Plus) which would be on top of the initial dressing. It can be torn cleanly by hand which makes it easy to administer. Petflex Pawprint Bandages are strong, durable and cohesive and they offer controlled compression, comfort support, and are available from VioVet in either self wound or reverse wound. Below are some recent questions we've received regarding Andover Petflex Pawprint Bandage, including answers from our team. 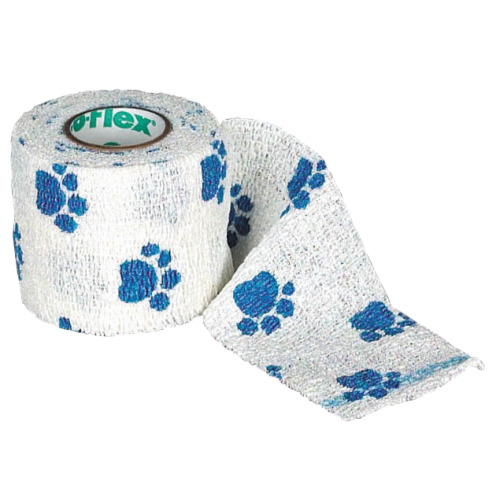 whats the difference between reverse wound & self wound on the petflex bandage? This is all about how easy it is to rotate the bandage around a limb and unwrap it easily as you go. The bandage itself, once in position, is the same whatever. Reverse wound has the surface which ends up on the inside when applied to the animal, on the outside of the roll of bandage. Normal wound has this surface on the inner face when you buy the roll of bandage. The difference is only obvious when actually applying it. Most people find the reverse wound easier to use.